The City of Cape Town is presented by mainstream historians as having been founded by Dutch East India Company Commander Jan van Riebeeck. But there is an alternative story about its foundation………. Before the African Indigene people first began receiving regular visitors from far off China and Europe, the local indigenous people, the Khoena, would annually spend their summers on the Cape Peninsula, known to them as ‘the place where the clouds gather’ – //Hui !Gaeb. 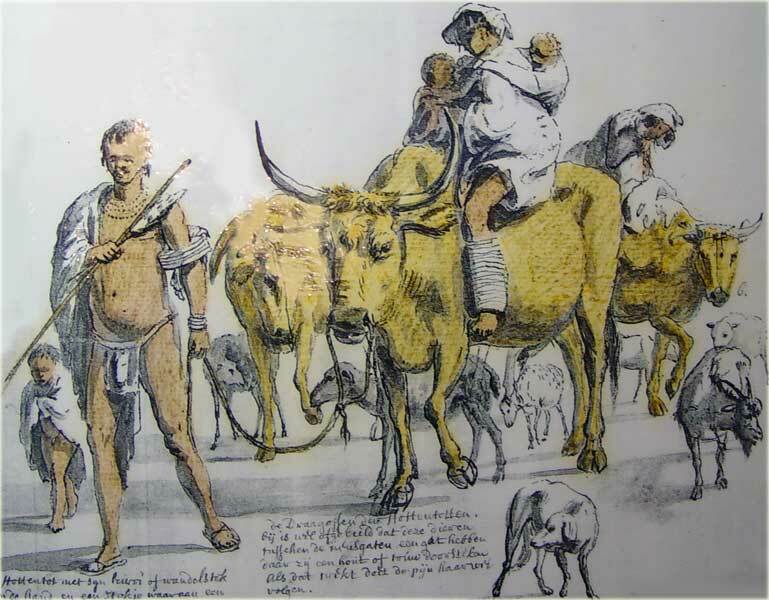 When winter came with its bitter cold, wind and rain, the Khoena would gather their cattle and retreat up the West Coast where it was warmer and drier. This annual transhumance pattern was to change for the first time in the first few decades of the 17th century. The most attractive and hospitable part of the Cape Peninsula was the lush areas around Table Mountain and the fresh water streams that flowed into the sea. Table Mountain was known as ‘the mountain of the sea’ – Hoerikwaggo – in the indigenous Khoena language. The fresh water streams, or sweet drinking waters, were known to the Khoena as ‘Camissa’ – //ammi i ssa. The Portuguese first name for the Camissa in Table Bay was ‘Rio Doce’ – sweet water, and then later ‘Agua de Saldanha’ . The Dutch called it the Platteklipstroom and the Soetwater-rivier. The place around the mouth of the main Camissa river flowing from Hoerikwaggo to the sea, was the ideal place for the setting up of camp by the Goringhaicona clan. According to European history the Europeans had been passing through Table Bay since 1488 and according to the Chinese accounts, the Chinese passed through Table Bay in 1421 for the first time. Chinese cartography provides the only map of the time showing clear features of South Africa such as the Drakensberg mountains. From the time of the Chinese voyage around the Cape by Admiral Zheng He in 1421, until 1652 when the first Dutch settlement occurred, there had been two centuries of interaction by the indigene Khoena people with foreign visitors dropping anchor in Table Bay. It was the regular visits by the Europeans which first caused an alteration in the nomadic habits of some of the Khoena who established the first trading settlement on the banks of the main Camissa river on the shore of Table Bay. It was this act that constituted the foundation of the City of Cape Town and was the root community, or footprint of the Camissa People and their descendants. These first maroons or drifters from a number of Khoena clans were called the Goringhaicona, or ‘children of the Goringhaiqua’. They were also scatterlings of the Gorachoqua, the Cochoqua and the Chainuqua. It was they who first broke the transhumance or wandering pattern. An introduction on the trading links, the communication and the cooperative relations of the Gorachoqua, Goringhiaqua and then the Goringhaicona with the passing Europeans was first provided to a mass readership in some detail by Richard Elphick in his book ‘The KhoiKhoi and the Founding of White South Africa (1975). The initial informal, though brisk, trading relationships that took root between passing ships and the Khoena people in the latter 1500s began to take a more formal form under Chief Xhore of the Gorachoqua after he was kidnapped to England in 1613 and returned a year later to the Cape. Chief Xhore (Coree) is the first recorded indigenous African from South Africa to visit England and was the most likely person to have founded the Maroon Khoena settlement at Camissa. Chief Xhore had later led the resistance to the English attempt to settle Newgate convicts at Camissa in 1615, but nonetheless maintained relations as a trader with the Europeans until his death. After Xhore’s death (at the hands of the Dutch) Elphick notes that trade relations with the Khoena took a nose-dive. But a short while later this gap was filled after Chief Autshumao of the Goringhaicona was taken on a visit to Batavia (Jakarta) in 1631. Mainstream historians omitted this story right up to recent times and presentede Chief Autshumao as an ignorant vagabond beach-bum whose first interactions with Europeans was in 1652. A new and intricate relationship was developed with Autshumao’s Goringhaicona involving a range of services including a postal service to passing ships. This first involved establishing a service station for ships on Robben Island served by more than 30 Khoena under Autshumao, installed there by the English. Later by 1638 this service-community relocated back to the mainland at the Camissa mouth where they continued to provide services. Under the entrepreneurial Autshumao an interlocutor bartering service relationship developed which slowly resulted in rebuilding the supply lines for the European travellers for the acquisition of meat and fresh water in exchange for a commission on transactions. The Dutch referred to the Goringhaicona as the ‘Watermans’ because of their association with the freshwater Camissa River and the seashore. It was from Camissa that foreign ships were supplied with the vital commodity – fresh water, by the Goringhaicona. All the hallmarks were in place to regard this as the first proto-refreshment station at the Cape and thus the foundation of Cape Town. The settlement of his people around Camissa was an advantageous strategic move on the part of Chief Autshumao as the community controlled the supply of water to seamen, and the control of trade with the same. When there were no ships in the Bay his people lived off fish and other seafood. By all accounts the Goringhaicona were typical ‘survivors’ and highly entrepreneurial. Although a much smaller group of people than the other groups, they were people who had drifted away from the older clans of Khoena and started a new lifestyle. They initially dominated relations between the Khoena livestock herders and the Dutch by setting themselves up as the negotiators at a lucrative commission. It was because of this, as can be seen in the Dutch Commander’s journal that Jan van Riebeeck developed a strong antagonism to Autshumao. It was also these Camissa people who first opened their arms to give refuge to runaway slaves and non-conformist Europeans and thus the character of the Goringhaiqua further developed over the years. Over a 183 year period 63 000 slaves were brought to the Cape where they and their offspring lived their lives as slave workers who built the City of Cape Town and its small towns and farms under Dutch and later British overlordship. The slaves came from other parts of Africa, from Madagascar, India, Indonesia and China. Autshumao had first learnt about slaves when he went to Jakarta and he also learnt about the differences amongst the Europeans. He used such information to his advantage. It was one of this Camissa community, Autshumao’s niece Kratoa, who was the first of the Khoena to adopt the Christian faith and formally marry one of the Europeans, a Danish barber-surgeon by the name of Peter Havgaardt who had changed his name to Pieter van Meerhof. Over time the small port town built around the Camissa Settlement became known as Cabo de Goede Hoop and grew into the City of Cape Town. The Dutch VOC agents were initially allowed to live cheek by jowl for seven months amongst the Khoena at Camissa while they built a fort just a stones thrown from the river. They later replaced the fort with a castle and diverted the Camissa into a moat around the castle. Over the years layer upon layer covered the Camissa River and it became a forgotten part of the city, but it still flows under the city to this day. Like the river, the identity of the Camissa people was layered over in time, as the history and heritage of the indigenous Khoena and the slaves at the Cape was also driven underground. The term ‘Cape Coloured People’ came into official use under British rule in the mid 1800s and the roots of the Camissa People and heritage were written out of the historical script. But since the liberation of the South African people in 1994 many are reclaiming our heritage and bringing to the surface the stories of the Camissa People and the heritage of indigenes and the enslaved is being proudly celebrated.